Clusters are points growing together on a matrix. Some Clusters grow on a sandstone matrix, others on all quartz, and still others may grow from a “seed” of crystal (like a mass of double terminated points). 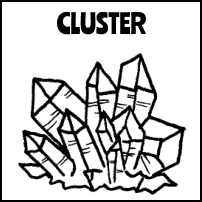 Clusters are good for helping with group dynamics. Families, co-workers, anywhere a group of people might need help in getting along. They are also good for raising the vibrations in an environment and bringing light and energy into that space. This Arkansas quartz crystal cluster has a thick sandstone matrix and an earthy energy. This is an Empathic Arkansas quartz crystal cluster with quartz and sandstone matrix. Arkansas quartz crystal cluster has many layers of points of all sizes, the largest is a Channeler, it has Barnacles and old soul energy. All-natural Arkansas quartz crystal cluster, just as it was when it came out of the mine. The message of crystals with the clay and mineral still attached from the mine is “Remember Where You Come From”. 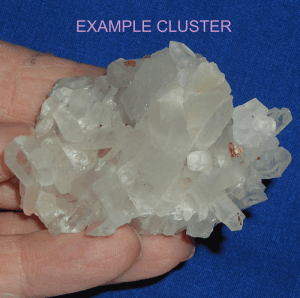 Small, flat Arkansas quartz crystal cluster, would look nice displayed on a small picture frame stand.